Canadian Prime Minister Justin Trudeau speaks at a press conference at Rideau Hall after being sworn in. Dreamy heartthrob Justin Trudeau was sworn in as Canada’s prime minister on Wednesday. 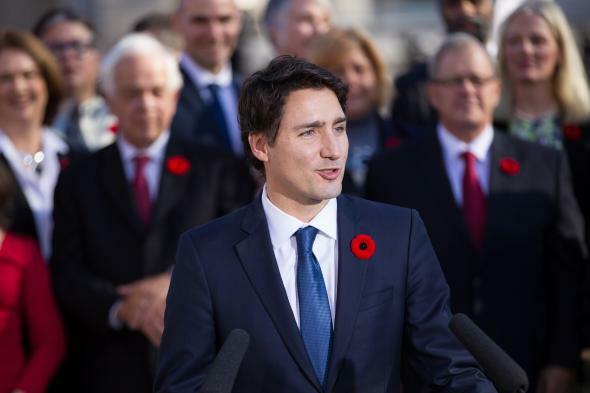 The 43-year-old’s sunny, optimistic demeanor has already changed the post-election tone in Canadian politics. How long that lasts, of course, remains to be seen. But Trudeau on Wednesday continued his hot streak by introducing his 30-person Cabinet that had just as many women as men—a first for the country. When asked why he opted for gender equity, Trudeau responded: “Because it’s 2015.” The current 16-person Cabinet in the Obama administration, by comparison, is made up of just 25 percent women.